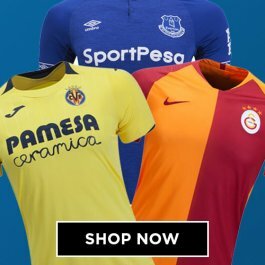 Buy the official Valencia football shirt from UKSoccershop and enjoy next day UK delivery and fast international shipping. 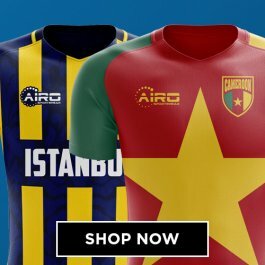 We sell only authentic Valencia soccer jerseys and stock the latest home, away and third replica shirts in adults and kids sizes. 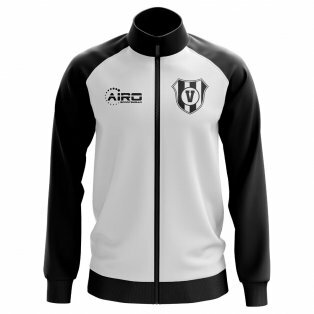 Available with shirt printing for your favourite players past and present or even your own name and number, we also sell official Valencia CF training kit including hoodies, training jerseys, sweat tops, tracksuits, pants, t-shirts and lots more. One of the most successful teams in Spain (leaving aside the Gary Neville era!) 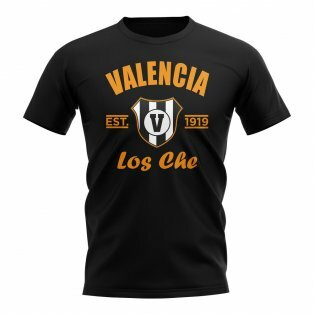 with six La Liga titles to their name, Valencia were founded in 1919 and play their games at the famous Mestalla stadium. The club’s logo features a distinctive bat, the reasons for which are the subject of much discussion. The club were even sued in 2013 by Marvel Comics who argued that this was an infringement on their Batman trademark, however the case was thrown out as Valencia had been using the crest 20 years before the first release of Batman. 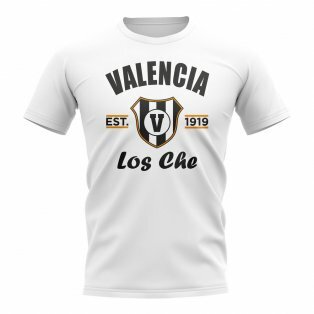 The Valencia home shirt is always white and is traditionally worn with black shorts and socks. The colour orange also regularly features as the trim for the jerseys. 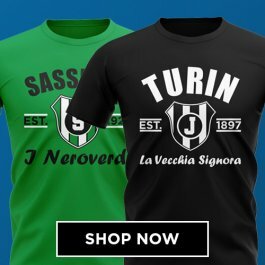 However, the club are arguably more famous for their Senyera shirt (which translates as flag shirt) and is worn as the away jersey. 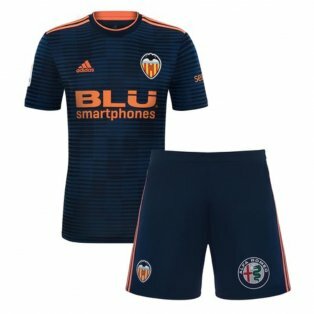 It is not uncommon at UKSoccershop for us to sell more of the away shirt of Valencia than we do for the home. The Senyera strip comprises of red and yellow stripes with a blue trim, which represents the colours of the Valencian flag. Dating back to the 13th century, it’s representation is hugely symbolic for the locals and is closely associated with the unique culture and history of the city. 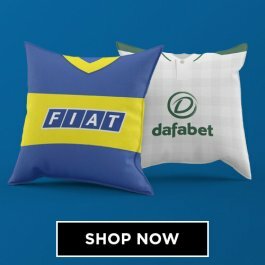 As a result, the club find creative ways to work this into the change kit. It was first featured in the 1934 Copa Del Rey final – which they lost 2-1 to Real Madrid – with the flag colours being featured on a burgundy shirt. 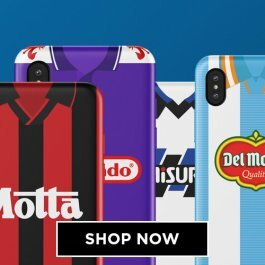 Other common variations have seen the entire strip comprise of the famous stripes, while blue and orange away shirts are also regularly available for sale. The first commercial Valencia CF jerseys were released by Adidas in 1980. 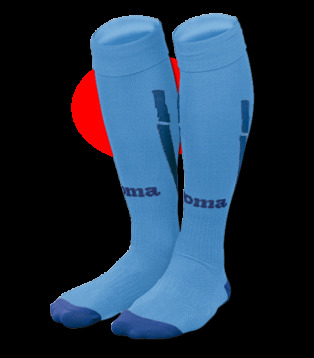 Since then, the club have had a number of kit suppliers including Puma, Nike, Kappa and Joma. 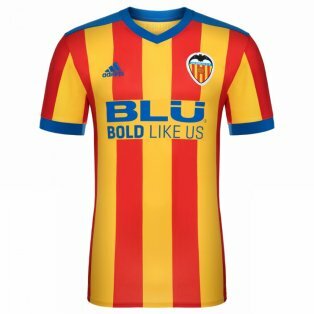 Valencia switched back to Adidas at the beginning of the 2015-2016 season.